In my Easter post, I addressed the oft-asked question, "Are Mormons Christian?" I shared my witness of Jesus Christ and included a video clip from an apostle that summarized the answer. An anonymous reader left a comment disagreeing with my declaration that Mormons are indeed Christians. He kindly shared a list of six points with which he disagreed. I responded briefly to our anonymous friend and promised to reply in greater detail to each of the points he raised. This post addresses the first point that God is a glorified being of flesh and bones. A Google search on the subject reveals several well written articles. An equally useful search on the phrase "Does God Have a Body?" delivers some of the same results and many others. I am not a Mormon apologist nor am I experienced in apologetics. I am just your basic member of the church. My family joined when I was very young, converting from Presbyterianism. I served a mission, was married in the Temple and have been attending church all my life. I think my religious experiences are typical of a Latter-day Saint living in Southern California. I have never had a problem with the doctrine taught that God is a glorified man and that he has a body of flesh and bones. I know some object to the idea that God was once a mortal man but it has always made sense to me. I don't pretend to understand the complexities of the universe. For example, who was taking care of things when God was going through his mortal probation? There are a lot of questions about God that I just put up on the shelf until some future time when I trust that they will be answered. Some get confused when others talk or write about God's father and the whole idea of eternal progression. I know some things have been taught and revealed about that subject, but frankly, I don't think about it much. It doesn't bother me. I have been taught and believe that the purpose of this life is to exercise faith in Jesus Christ and prove myself obedient to His commandments revealed in scripture, both ancient and modern. I am a very simple man, really, but it makes me happy to think of a loving Heavenly Father who understands me perfectly because He has gone through the same kind of mortal experience. From Mormon.org: "God is your Father in Heaven (Matthew 6:9). We call God Heavenly Father because He is the Father of our spirits and we are created in His image ( Genesis 1:27). God has a body that looks like yours, though His body is immortal, perfected, and has a glory beyond description. He knows you personally and loves you more than you can comprehend." From True to the Faith: "God the Father is the Supreme Being in whom we believe and whom we worship. He is the ultimate Creator, Ruler, and Preserver of all things. He is perfect, has all power, and knows all things. He 'has a body of flesh and bones as tangible as man’s' (D&C 130:22). Our Heavenly Father is a God of judgment and strength and knowledge and power, but He is also a God of perfect mercy, kindness, and charity." From Preach My Gospel: "God is our Heavenly Father. We are His children. He has a body of flesh and bone that is glorified and perfected. He loves us. He weeps with us when we suffer and rejoices when we do what is right. He wants to communicate with us, and we can communicate with Him through sincere prayer." I know this is not a deep discussion on the subject of the nature of God. There are so many more ideas that could be addressed. This post focused on one idea: God has a body of flesh and bone. Note that we do not teach that God has a body of flesh and blood as that is a condition of mortality. God is a glorified, immortal, perfected being and we are made in His image. It is not a hard doctrine to comprehend. Man has made it difficult through uninspired creeds and interpretations of scripture that are not correct. That is why we need Apostles and Prophets to help us come to the unity of faith. I am so grateful for the Prophet Joseph Smith who bore a plain a simple testimony that he saw God the Father and His Son Jesus Christ. So is this different from what the Christian world teaches? Yes, it is. We believe in a "Restored Christianity." Any doctrinal disagreements we have with ministers of other faiths can be summarized in one statement: We do not rely solely on the Bible for our understanding of the nature of God. Our understanding is based on knowledge revealed through modern prophets. David L. Paulsen, “Early Christian Belief in a Corporeal Deity: Origen and Augustine as Reluctant Witnesses,” Harvard Theological Review, vol. 83, no. 2 (1990): 105–16. David L. Paulsen, “The Doctrine of Divine Embodiment: Restoration, Judeo-Christian, and Philosophical Perspectives,” BYU Studies, vol. 35, no. 4 (1996): 7–94. Or, more simply, this talk from Elder Jeffrey Holland: click here. One of the problems with God being flesh and bone and originating from a planet orbiting the star Kolob is that it seems to violate Genesis 1 and all known current scientific knowledge. Both Gen 1 and the Big Bang Theory say that everything, time, matter, energy and space came into being at the point of creation. That means the entire universe did not exist prior to God creating it. But Mormon doctrine says he came from a planet much like ours. And since matter did not exist prior to the universe existing it seems diificult that God would be composed of matter (of course the Bible says that God is not a man but is spirit). Further if no matter or time existed before creation, where did the planet come from. Thanks for visiting my blog and leaving a comment on my essay about the nature of God. We base our belief that God is a glorified being of flesh and bones on the testimony of the Prophet Joseph Smith. He taught over and over that God has a body of flesh and bones as tangible as mans but that it is resurrected and perfected. Simple logic to me dictates that it must be so. I have a physical body and have received a wealth of knowledge as a result of this body. If God did not also have a physical body then I would have more personal knowledge than God. I can't worship a God who doesn't know more than me so that's the end of that argument for me. I don't know much about Kolob or the planet that God currently resides on. I don't find that to be central to my salvation. I like the accounts of the creation I read in the Book of Abraham and the Book of Moses, revealed through the prophet Joseph Smith and contained in our scripture, the Pearl of Great Price. The first chapter of Genesis is missing a lot of material that has been lost over the years. I also don't know much about the Big Bang theory and certainly don't place much stock in all known current scientific knowledge as a basis for my faith in God. I have watched scientific theories in my lifetime come and go. What one day we call fact is the next day "proven" to be false. Thus all collected scientific knowledge of man is nothing compared to what God can reveal to us through the gift of the Holy Ghost. I invite you to increase your knowledge of the things of God by going beyond what science has to say. Seek after and obtain the gift of the Holy Ghost and you too can come to the same understanding that millions of Latter-day Saints have obtained - that God does indeed have a glorified and perfected physical body and that we are created in his image. This knowledge brings great peace and power to my life. I am confident that when I return to the presence of God after this mortal life has concluded for me that I will see and recognize him just as Joseph Smith described, for he testified that he saw him. The power comes from knowing that I can become like God when I too am resurrected and receive a body that is like his to never die again. Isn't that powerful? "We base our belief that God is a glorified being of flesh and bones on the testimony of the Prophet Joseph Smith. He taught over and over that God has a body of flesh and bones as tangible as mans but that it is resurrected and perfected." The Book of Mormon teaches about the Great Spirit and always speaks of God as a spirit (Alma 31:15). 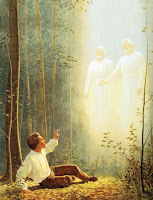 You may believe that once Joseph Smith saw God the Father and Jesus in the sacred grove that he knew from that time on that God had a body of glorified flesh and bone. This is clearly not the case as we follow church history. You can see in the Lectures of Faith which were printed in the Book of Commandments that God was still believed at that time to be a personage of spirit, and Jesus and was person of tabernacle(flesh). This distinction is quite clear. Joseph's theology progressed into polytheism and that of a corporeal God. "If God did not also have a physical body then I would have more personal knowledge than God." The Bible speaks Jesus condescending into a body. Thank you for this post, I randomly stumbled upon it and found it very insightful. I am a member of the Church and have recently been thinking a lot about prayer and how I can make my own personal prayers more meaningful. I realized that while praying, I have trouble realizing the actuality of God as a being of actual flesh and bones. I believe in God and I know that once I fully realize that He is an actual individual with a body like mine, but perfect and glorified, and gain testimony of this, my prayers will become more meaningful. I really enjoyed your insights and appreciate your wealth of knowledge and testimony. I loved what you said "If God did not also have a physical body then I would have more personal knowledge than God." This is an interesting point that I had not thought about before. I believe and know that God is the Master of the Universe and knows all things, therefore, in order for Him to be God, He would have to know all things, including all mortal experiences which would obviously include a body. I just wanted to thank you for your post, it has blessed my life. Keep them coming! "If God did not also have a physical body then I would have more personal knowledge than God." Hi, why would God need a body in order to gain 'personal knowledge'? Simple logic to me indicates that God is limitless in abilities and knowledge and thus would not need a body in order to gain 'personal knowledge'. Thanks for your comment. Members of the LDS Church base their believe in an anthropomorphic God on the testimony and revelations of the prophet Joseph Smith. Among those revalations is the Book of Mormon which contains multiple references to a resurrected Jesus. I just can't imagine meeting God after this life is over, asking him some questions I have about the mortal body and having him say, "Well, I don't know. I never had a body so I can't answer that." Simple logic to me indicates that God has a physical body. I am his son made in his image so I look like him. His body is glorified and perfected - no death or disease. I look forward to being resurrected so I can be like him someday. Very respectfully, Tim, I disagree wholeheartedly with the notion that because we are made in God's image and likeness that He in turn is like us in regard to embodiment. You wrote, "Simple logic to me indicates that God has a physical body. I am his son made in his image so I look like him. His body is glorified and perfected - no death or disease. I look forward to being resurrected so I can be like him someday." While I also am excited about the day when my body will be resurrected and no longer subject to death and disease, I maintain that God the Father is the source of our future eternal nature and not a fellow recipient of our eternal promise. In other words, God IS eternal by very nature, we will BE GRANTED eternal life according to His grace (read: the lavish outpouring of unmerited favor) through faith in Jesus. Furthermore, I can identify with your desire to apply logic to this matter. Here is a very logical analysis that is easy to understand regarding this topic. If I am looking at my image in a mirror, is it also correct to deduce that the person gazing back at me also is comprised of flesh and blood just because the image is organized like me (i.e. two eyes, one nose, etc.)? That is simply a misapplied deduction of logic. Being made in God's image works the same way. We might be a reflection of some of His divine attributes (creativity, ability to make choices, emotional, etc.) so we are indeed made in his likeness/image, but to say we are of the same substance as God is contrary to Biblical scripture (the kanon, or measuring stick, which God has given us to measure Truth). For further clarification on the meaning of translated biblical words, it is helpful to use a concordance. There are excellent resources on blueletterbible.com. The "C" icon next to each verse will give you access to the concordance. The word translated as "likeness" in Genesis 1:26 is also used in 2 Chronicles 2:3 ("similitude" of brass oxen used in Solomon's temple). Although the brass oxen were said to be in the likeness/similitude of a live oxen, they certainly were not composed of the same flesh. The word translated as "image" gives a sense of "shadow," i.e. a vague resemblance but definitely not implying an identical composition. If you'd like to examine the evidence for yourself, here is the link to "image" and you can follow the blue number links next to "likeness" in the verse references below it: http://www.blueletterbible.org/lang/lexicon/lexicon.cfm?Strongs=H6754&t=KJV. It would be unfair to write this comment and disregard your belief in Joseph Smith's testimony that God the Father has a body of flesh and bones. I understand that you believe he's a prophet. But again, the New TESTAMENT (the testimony of those who had the closest encounters with Jesus during his ministry on this earth), states that God is a Spirit (John 4:24). Does God contradict himself? Does He not know His own nature well enough to reveal it correctly initially? What are your personal thoughts on John 4:24? As someone who has received the gift of the Holy Spirit, I testify that there is only ONE God in existence anywhere, and He is the source of all creation, not merely a component of created beings. To Him be all Glory, forever and ever! Hello again IHeartMormons. Thanks for coming back to visit my blog after such a long time away. I’m happy to see that you have been reading my material. How have you been? I visited your blog but haven’t seen much there lately. Are you on Facebook? I’d like to get to know you better. By the way, my blog has moved to Latter-day Commentary. I wrote this so long ago that I had to go back and see what my main point was. Ah yes, it was simply my belief, based on the testimony of Joseph Smith, that God has a glorified immortal body of flash and bones. And as I stated, it just makes sense to me that he does. I would have a hard time exercising faith in someone as a GOD if he had not personally experienced what I am going through as a mortal. Yes, God was once a mortal like me. That’s what I believe and so do the majority of other Mormons. Ultimately, unless you have seen God you can’t say that he doesn’t have a body. Of course, neither can I since I haven’t meet him in this life. I guess we’ll just have to wait until the next life to see if Joseph Smith told the truth. I hope we can still be friends even though we believe different things about the nature of God. As I get older I’m not very interested in arguing religious beliefs. I’m much more interested in helping people feel loved, accepted and important. I mean that. We are important to each other or we should be. We are family because we are all children of God. He loves us and we should love each other. I would be happy to continue this dialog if you want but for my part, the idea of a personal God with an immortal and glorified body was settled in my mind long ago. I look forward to seeing him again after this life. "I just can't imagine meeting God after this life is over, asking him some questions I have about the mortal body and having him say, "Well, I don't know. I never had a body so I can't answer that." First off you have taken away one attribute of God we should all agree on and that is His omniscience. With that being said wouldn't the creator of all things have ample knowledge of his creation? God is a spirit John 4:24 and spirits have no flesh and bone Luke 24:39.